This website is a personal project but a good model to show some popular business concepts with the websites that we build for clients today. We have recently shared with a number of potential clients to show ideas both about online marketing as well as technical concepts and ideas. 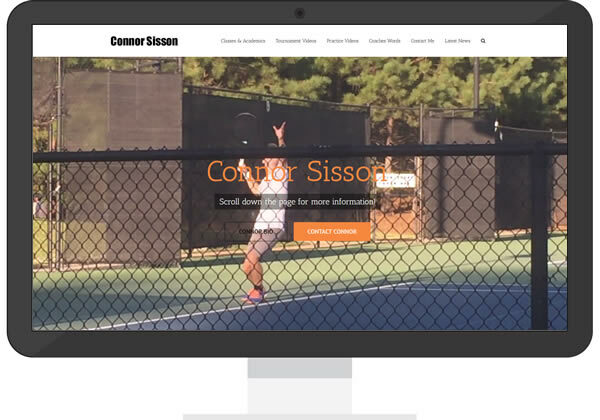 The site was created for our son, Connor, who is a competitive junior tennis player. As originally intended, Connor can and does fully update the site on his own. As a marketing site first and foremost (to stay in front of college coaches), this should be the fundamental reason any business has a website in the first place. As a recruiting site, it was built to make it easy for coaches to get to know Connor and keep up with his progress during his competitive high school tournament years. However, the site also serves as a specific model for some small businesses looking for website ideas for their own lead generating websites. From a technical perspective, the site is utilizes active video as part of the header, and something called ‘parallax scrolling’ to allow a small site to combine several sections or concepts into one long page.